The “Sandye” commemorates the end of the official summer season. Above and on this page: Sandye day in Allenhurst. COASTER photos. Ultimately, the tradition moved to Allenhurst under the passionate guidance of resident Freddie Lehmann. 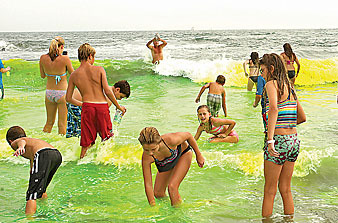 Today, his son Jack continues to oversee the dyeing of the ocean bright green. “Some say it is good luck to dip in the green water,” said Jack Lehmann. Even when Lehmann found himself working on the other side of the country for five years, it was important for him to continue the wonderful beach tradition. The ceremony begins with a bagpiper walking south on Ocean Avenue, down the cement stairs to the beach and north to the jetty between Allenhurst and Deal. With each step, the bagpiper – like a modern-day Pied Piper – finds more children following him. After careful examination of currents, wind and waves, three large vats of dye are sprinkled 125 feet off the shoreline to the delight of children of all ages. The bright green dye is approved by the Environmental Protection Agency and used by the Coast Guard during oil spill containment drills. The dye is also found in marine emergency kits and in many lifejackets. 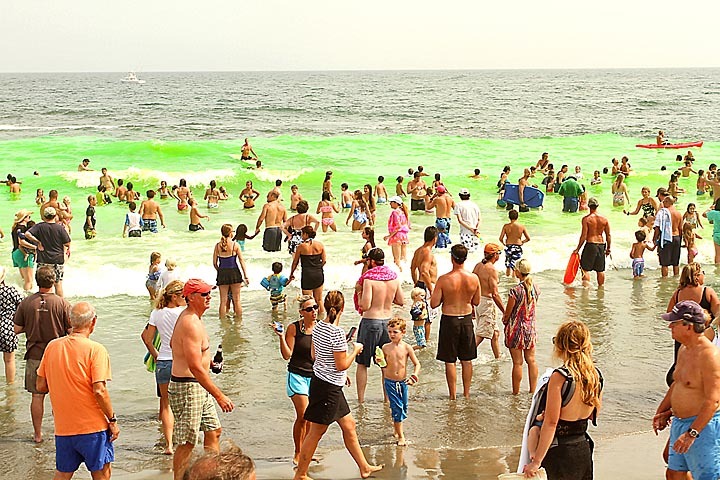 As the dye permeates the water and moves to shore, children run to bottle the water challenging each other to “get the greenest water.” Adults dive and dip into the neon waves hitting the jetty that is crowned by a flowing American flag honoring and commemorating local loved ones. I absolutely love the traditions of this area. Posted in Shore Communities and tagged Allenhurst, Richard Virgilio.